Away From Blue | Aussie Mum Style, Away From The Blue Jeans Rut: Asos Maternity Pencil Skirts, New Years Fashion Resolutions, Australian Giveaway! 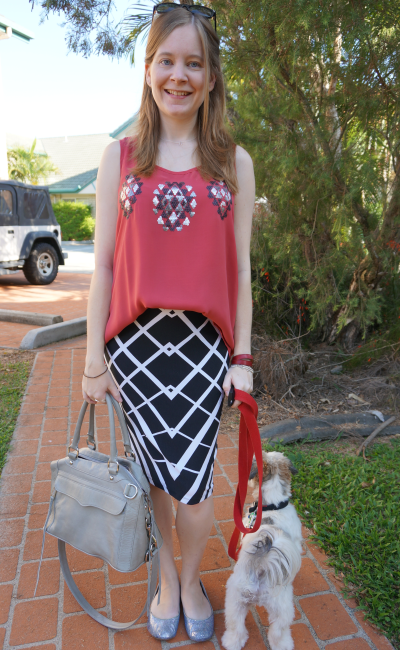 Asos Maternity Pencil Skirts, New Years Fashion Resolutions, Australian Giveaway! Have a special Australian only giveaway today, just scroll down! I used to wear this top a lot to uni and to work when I worked in a non-public facing office role and wore jeans every day. Over 5 years ago! It's obvious now why it got less wear when I changed jobs and was no longer able to wear denim every day, not a flattering silhouette. Last worn: Ray Ban, tartan pencil skirt, black flats, Balenciaga sapphire city bag. First time I've worn the top on the blog. 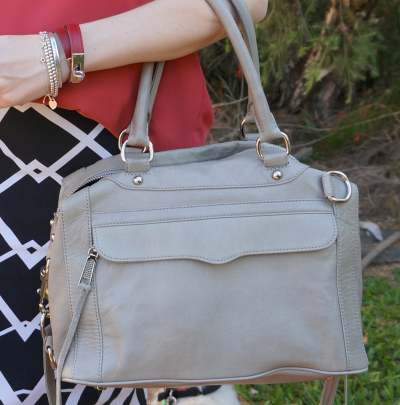 Linking up with Style Sessions, Spotlight Weekly Linkup today. Last worn: Ray Ban (see above), sequin detail tank, graphic print pencil skirt, glitter flats, Rebecca Minkoff grey MAM. The lovely Sophie has been in contact with me to offer one lucky reader a $30 voucher to Paul's Warehouse! They ship anywhere in Australia, or you can use the voucher in store. They have a 'Buy One, Get One Free' sale on at the moment, so you could get a new pair of shoes, or some cute work-out clothes using your credit. To enter, you have to have an Australian address. Then just answer the question: "What's your New Year fashion resolution?" and leave your answer and a contact email address in a comment below. The most creative answer (judged by my hubby!) will win. My New Year's fashion resolution is definitely to wear what I own more often to prevent hidden wardrobe surprises! Haha! Have you made a fashion resolution for this year yet? Entries close on Tuesday 28th January, and you can enter as many times as you like. Are you pregnant? If so, congrats! Whoa, I am in love with your second outfit! I like how you styled the skirt & the top together- perfect combination! The second outfit is killer!! Love the combo Mica..
i really love your work wear!! its so pretty!! Mica I like how you layered the silver necklaces. ANd trust me you will find things in your closet you have forgotten totally about... take it from the, the constant closet editor who always finds something . hehe, I'm just surprised by how much I'm finding...i thought my wardrobe wasn't that untidy before, but I was wrong! The second outfit is my favorite:). Your dog is sooo cute! Ahh I am so loving the second outfit - It's something I would totally wear! Love the colors and the pattern of your skirt! Looking lovely Mica!! My new year fashion resolution is to accessorise more and dress up my plain clothes especially work clothes so I sparkle more throughout the day! You always look lovely and I am in love with your bags!! Great resolution and entry Sophie! Love the black and white skirt, and the red really makes it pop! I love that black and white skirt - the pattern is so pretty and I love it paired with the coral. I was going to say, oooh baby bump alert! Hehehe! Congrats again lovely, you're glowing and definitely going to be a very fashionable mummy! Love the skirt in the second image. Fashion NY's resolution? Well, be more fearless, step out of my comfort zone and probably, the most important, start treating my clothing with a little more TLC! You're looking do radiant, Mica! Love the way you've styled your cute bump. i love your first outfit! it shows off your cute bump perfectly! I love both of your skirts, they are beautiful and very flattering. OH MY GOSH YOU'RE PREGNANT!!!!!! My fault for being so inundated at work and not visiting your blog!! Congratulations darling girl, you are a radiantly flawless mother. Cute dog!!! You look amazing. I am in love with both of those skirts! I didn't try any ASOS maternity the first time around, but might have to if we try for another one. I am cleaning out my closet too, but keep setting things aside because sometimes non-maternity works well for pregnancy too! Mica, you are doing so awesome with the transitioning to maternity wear. You go girl! Both outfits are nice. LOVE that first one girl. So pretty. Both of these looks are adorable, but I'm really loving you in the bright top! So cute! You look so pretty, I LOVE the second outfit. The skirt is so cute! You're pregnant?? Holy smokes, congratulations, Mica! That skirt is gorgeous and you are right about pairing it with the top. My new years resolution is to wear my favourite, special occasion clothes all the time, instead of 'saving' them. Goodbye old daggy shorts with paint stains, hello pretty dresses! Oh that is a great resolution! I need to do more of that too - wear things instead of saving them up for possible future occasions! OMG!!! You look so amazing!! Congratulations on your little one and you are rocking maternity style mamma :) PS. I'm preggers too! My resolution is to wear more colours, other than black skirts or slacks. In 2014 one of my resolutions/goals is to 'find my style'. I confess until now fashion was one of my last priorities. When I was a teenager/student my focus was on successfully passing exams and graduating (plus I had no money). Then when I started working my focus switched to being good at my job, learning on the ground (and again I wasn't getting paid much and preferred travelling the world rather than buying clothes!). Then once my career was established and my revenue increased, we bought a home. So again shopping and spending money in clothes wasn't important to me. I turned 30 a few months ago and only recently I realised I'm finally starting to understand what styles suit me best. Discovering oneself is such an important part of personal development. In 2014 I want to learn about myself and feel more confident. I want my style to reflect better my personality. Clothes don’t have to be expensive as long as you get the styles/colours that are right FOR YOU. Thank you all for your kind comments - and all of the current entries into the giveaway. My new year resolution isn't so much a specific goal but more trying to do the things I should be doing or the steps to take me there. Thanks for your entry SJ! Do you have an email I can contact you on if you win? Thanks for your entry Sara! Do you have an email I can contact you on if you win? Congrats on your pregnancy! :) You look fabulous! Love those outfits. My 2014 fashion resolution is to be Cinderella before midnight and not after - instead of constantly feeling like I'm dressed in rags and bumming around the house, I want to be the belle of the ball and glam it up when I go out! No more yoga pants and tank tops outside the house!!!!! email is charlottescotton (AT) gmail (dot) com ... thanks for the chance!